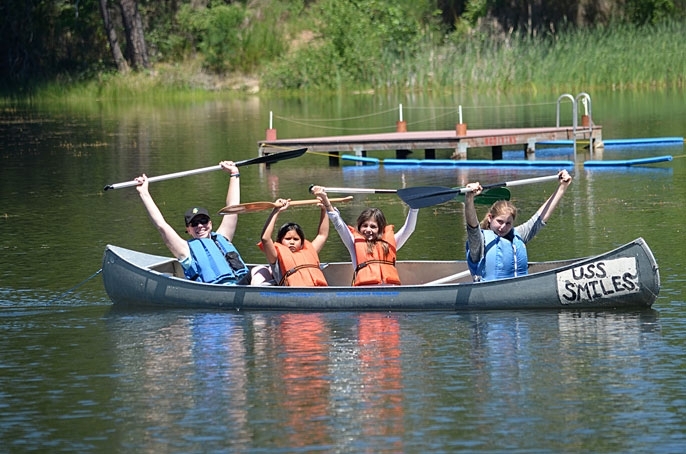 Canoeing on a mountain lake, telling stories around a campfire, sleeping under the stars — it's the quintessential summer camp experience — and for thousands of California kids it's also their first introduction to UC's 4-H program. 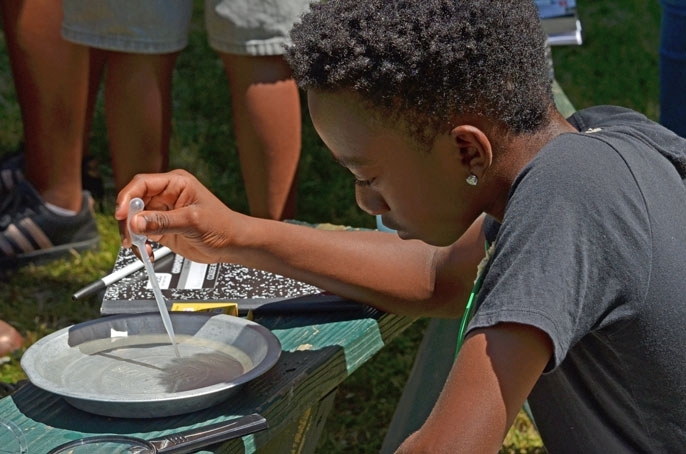 And just like the popular program that teaches children to raise and care for animals, 4-H summer camp is as much about leadership training and science education as it is about making new friends and getting out in nature. “So many of the kids live in the city and for a week they get to escape,” says Tiffany Marino, who joined the Monte Vista 4-H Club in Chino as an 8-year-old and has loved it ever since — especially summer weeks spent at Camp Seely near Lake Arrowhead, with the Los Angeles 4-H program. The camp is set on a hill with cabins, a fire circle, a mess hall and lodge. There are volleyball and basketball courts, and a pool. “It's all surrounded by trees and greenery. It's so beautiful. It's this one week in summer where everything is OK,” Marino says. Kids from all over Southern California come to this magical spot, making tight friendships and getting a breather from city life. But the thing that really makes the camp special is not the setting, Marino said. It's that the teachers and counselors are themselves kids — high schoolers who spend months before camp working together to plan it out, developing educational programming and other fun activities for the week. When summer comes, they put their plans into action, getting first-hand experience teaching classes, leading activities and ensuring that campers have a memorable time. Adult volunteers keep an eye on things, but the teens themselves run the show, said UC Cooperative Extension's Keith Nathaniel, the Los Angeles county director & 4-H youth development advisor. Along with archery, nature walks, swimming and other traditional camp activities, the teens hold science-based classes that challenge campers to work in teams to come up with solutions for things like how they would improvise a shelter to get out of bad weather. Rose Clara and Connor Gusman, rising seniors at C.K. McClatchy High School in Sacramento, have both spent time as teen leaders with On the Wild Side, a 4-H camp that brings fourth through sixth graders from disadvantaged communities out for a weekend in the mountains near Nevada City. The goal is to give campers a chance to explore and learn about the natural world in a way that is fun and builds confidence. Clara helps her young campers quickly feel at home by playing an icebreaker, like the game where each person names a favorite thing — maybe a food or an animal — and everyone else who likes that same thing steps into the circle with them. “It's a way to unite everyone,” Clara says. Both she and Gusman discovered that they liked teaching and bonding with the kids so much that they went from being camp counselors to joining the program development committee, a team that chooses the curriculum and plans the whole camp. Gusman even helped write a grant that secured $500 from the Sacramento Region Community Foundation to help off-set the cost of buses and meals for the campers. One of his biggest surprises was learning how much of an impact he could have as a teacher. 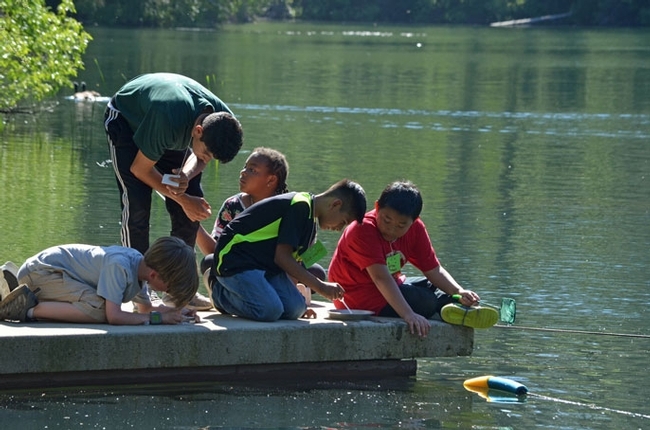 He used the small lake by the camp to show the kids how to assess water quality, including analyzing the prevalence of indicator species that can tell you if the water is clean and healthy. “Going through the process of developing the lesson, I wasn't totally hooked until we were at camp. There was one really shy girl who on the first day said, ‘I don't like science.' Then at the end, she was like, ‘I really loved it and I'm going to take as many science classes as I can,'” Gusman said. Marianne Bird, the 4-H youth development advisor in Sacramento County who oversees 4-H On the Wild Side as part of her work with UC Cooperative Extension, said that teens are particularly effective as teachers. “They have a rapport with the little kids that as adults we don't always have,” Bird said. Both she and Nathaniel evaluate the camps once they end, and survey both participants and teen leaders about their experiences. The responses on both sides are overwhelmingly positive. One of the questions they ask the teenage teachers is whether they feel that they've made a contribution to their community, Bird said. The proof comes in seeing how these young leaders grow and change from their experiences. Rose Clara, for instance, knew she liked teaching before she started volunteering with 4-H, but the camp experience has given her a new passion for advocacy and political science. She has joined the California Association of Student Councils and used her newfound leadership skills to host a mental health awareness week at her school. “I think that comes from 4-H — stepping up like that. I want to help people,” Clara said. At 19, she has now reached that bittersweet moment where she has “aged out” of 4-H. But through its programs, she learned to raise and show animals, came to understand civics through trips to Sacramento, and developed her leadership skills and style. A sophomore majoring in business at Cal Poly Pomona, 4-H has taught her that she can succeed. This article courtesy of the UC Office of the President.